There is an increasing demand for synthesis of high quality novel quantum materials with exotic properties. 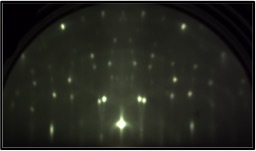 Molecular beam epitaxy (MBE) is an excellent technique to grow crystalline thin films by deposition of atoms or molecules layer-by-layer onto a substrate. The advantages of MBE over other growth methods include better control of doping, uniformity of epitaxial film thickness, and sharp crystalline interfaces in heterostructures. Our focus is to grow variety of materials including: 2D Si/Ge/Sn, graphene analogues, topological Dirac 3D semimetals, complex oxide thin films & hetero-interfaces, and magnetic thin films. Some of these materials are predicted to exhibit exotic topological phases, such as near-room-temperature quantum anomalous Hall effect and topological superconductivity. In addition, we intend to tune the band gap and SO coupling in these materials by surface functionalization and alloying. The experimental technique to mechanically assemble extremely clean interfaces of arbitrary atomically thin sheets of van der Waals (vdW) materials provides unprecedented flexibility to control the physical properties, modify spin-orbit coupling and band structures, and induce magnetic and topological correlations by proximity effects at the atomic limit. We use van der Waals based transfer technique, in a controlled environment, to assemble 2D/2D, 2D/3D, 2D/1D cross-dimensional hetero-structures to study the electronic, spin and optical properties of these systems. We are also developing a transfer tool to assemble cross-dimensional material hetero-structures in ultra high vacuum to exploit the true potential of intrinsic phenomena that emerge at atomically clean interfaces. The material synthesis and interface enginnering provides us the ability to investigate novel physics phenomena in vast class of quantum materials using ARPES, in-situ magneto-transport, magnetization dynamics and optical techniques. 1) Jinsong Xu, Jyoti Katoch, et. al. "Growth of uniform CaGe2 lms by alternating layer molecular beam epitaxy", Journal of Crystal Growth, 60, 134-138 (2017). 2) Simranjeet Singh*, Jyoti Katoch*, et. al. "Strontium oxide tunnel barriers for high quality spin transport and large spin accumulation in graphene", Nano Letters 17, 7578–7585 (2018). - "Strontium oxide as a tunnel barrier for spin injection and gaint spin accumulation", Submitted to the U.S. Patent and Trademark Office, application no. 15/631, 825 (pending). 3) Jyoti Katoch*, Soren Ulstrup*, et. al. "Giant spin-splitting and gap renormalization driven by trions in single-layer WS2/h-BN heterostructures", Nature Physics 14, 355-359 (2018). 4) Simranjeet Singh, Jyoti Katoch, et. al. "Nanosecond spin relaxation times in single layer graphene spin valves with hexagonal boron nitride tunnel barriers", Applied Physics Letters , 109, 122411 (2016).